If you are interested in special seminars please let me know via e-mail. Then you will get an english description by e-mail. What does a woman wish for herself more than anything else? In a celtic fairy-tale a wild man catches the king and gives to him this riddle to solve to get free. The king collects many answers, but they don´t solve the riddle. A deeply ugly woman – the sister of the wild man – offers him a deal. The king gets the solution and must give to her one of his knights as a husband. His noble nephew is prepared to marry the lady for the honor of the king.. The openness to look at the ugliness and to integrate it offers a solution that lies beyond ugliness and beauty. The solution of the riddle in the fairy-tale is: Sovereignty, the right to search for an own way through life. We will dance our way to be free. With the help of the story we will meet with our sovereignty and the joy to follow our heart. If we are open to ugliness and beauty at the same time we can get free to follow our real values in life. As women we often are tempted to limit ourselves and become domesticated when we deal with the question if we are beautiful. While dancing we feel the magnetism of the body, our power and the relationship we have to the Whole. I work with dances out of the space of the heart, circle dances, dreams and heart-meditation. Everyone is fully responsible for what happens during the dance work. When we dance JOY appears. The body is flooded by it. We are one with ourselves, open for the moment. If we enclose Heaven and Earth in our dances we consciously take part in this miracle. While dancing we can attune ourselves to the unseen and dynamic essence which manifests in an amazing and secret way in the dance. So we are connected with the Divine and with the soul of the world at the same time. We strengthen our connection downwards to the Earth and upwards to Heaven in the simple dances. We learn to be attentive and let go of our thoughts while repeating the steps. In the free dances we open to the movements that our body needs to express. The formless and the form together create a space where we can feel held in our hearts and our bodies. Gravity and lightness combine step by step. The secret of life is dancing with us, jumping in our steps and telling us a joke. While dancing we are part of the ongoing process of creation in which everything is connected to each other and held by Love. We will work with dances out of the space of the heart®, free dances, meditation of the heart and dreams. Intuition and freedom in dance"
The old wolf-crone collects the scattered bones of dead wolves in remote areas and puts them together with her love for detail. Then she sings over the bones for a long time till the flesh comes back, then skin and fur. In the end suddenly the wolf jumps into life and runs to the horizon where he turns into a woman laughing hard. My view of this story changed over time and grew more subtle. Today it seems to me as a lifetime process of learning and becoming more conscious in which we as women take part again and again. The wise old woman remembers the wolf and the inner woman and their relationship with each other. It is about the path of the soul. The bones of the wolf represent the strong grounding in the origin. The flexible body-parts out of which the woman appears are surrender and longing. The consciousness in women that is showing itself always anew is a male part in the soul who helps us to be grounded and present in the body and brings light into unconscious patterns. The wolf and the woman are in love with each other. Love is about oneness we want to become one with our beloved. The wolf is embodied in the bones of the resurrected woman. We can contact the wild parts of our soul in the dance and open for her free and groundbreaking expression. While dancing we can learn the truth about our inner nature. The primal female wisdom is experienced in the body. We need our willingness to confront our immense power and light as an asignment. This means coming into contact with our sacred core and our longing for wholeness. I work with dances out of the space of the heart®, circle dances, dreams and heart-meditation. What counts is not the enormity of the task, but the size of the courage. Star-money is the fairytale about a lonesome girl who sets out on a journey without any belongings except the clothes she wears and the bread in her hand. She shares both things with other destitutes. In the end she is standing naked with a pure heart in the woods. There a miracle happens. The stars fall down from the sky as golden coins. It is the moment in which we hold onto nothing anymore and suddenly everything is given. A moment of complete trust allows for the opening into another dimension which is outside our imagination. To say yes even if we don´t know anything requires courage, patience and trust into the unknown. We open and move into the empty space of our longing, naked and bare yet unbelievably held by resting in the essence. This is possible through the female power in us which we can sense and access in dance in a simple and easy way. The different steps allow us to trust the moment and to receive. The stars take hold of us in their infinity while dancing. So we can be star-money with all the wonder. Dancing we are open for the whole which is shining through being. she is enclosed by the dancing shrubs in the wind. When we dance JOY appears the body is flooded by it. Movement connects us with the essence because we open to the moment. If we enclose Heaven and Earth in our dances we consciously take part in this miracle. While dancing we can attune ourselves to the unseen and dynamic essence which manifests in an amazing and secret way in the dance. So we are connected with the Divine and with the soul of the world at the same time and dance our role as human beings in the cosmos. We strengthen our connection downwards to the Earth and upwards to Heaven in the simple circle dances. We learn to be attentive and let go of our thoughts while repeating the steps. In the free dances we open to the movements that our body needs to express. The formless and the form together create a space where we can feel held in our hearts and our bodies. Gravity and lightness combine step by step. The secret of life is dancing with us, jumping in our steps and telling us a joke. While dancing we are part of the ongoing process of creation in which everything is connected to each other and held by Love. We will work with dances out of the space of the heart®, circle dances, meditation of the heart and dreams. Cornelia Freise: Born in 1957, living in Bremen in northern Germany. Graduation in law, after a major shift in my life I have begun to teach sacred dance in 1986. Since 1992 I have worked free lance as a dance therapist (HPG). 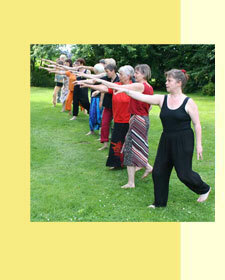 In 1996 foundation of "The dancing wild sow – Institute for transformation through dance, meditative dancing and dance therapy" in Bremen which makes available 2-year-dance-trainings „Dancing out of the room of the heart" for people from different professional backgrounds. International workshops in California, Singapore and Estonia.